Sydney Shop Girl: Life This Week 13/11/2017: My Last Year of High School. Life This Week 13/11/2017: My Last Year of High School. The year was 1992 (!!) and as with any bygone decade, the hair looks of the moment have aged rather badly in the decades that have passed since. The reason the hairstyles of 1992 loom so large in my mind is because hair wasn't as tightly governed by my school's uniform policy as the rest of my appearance was. 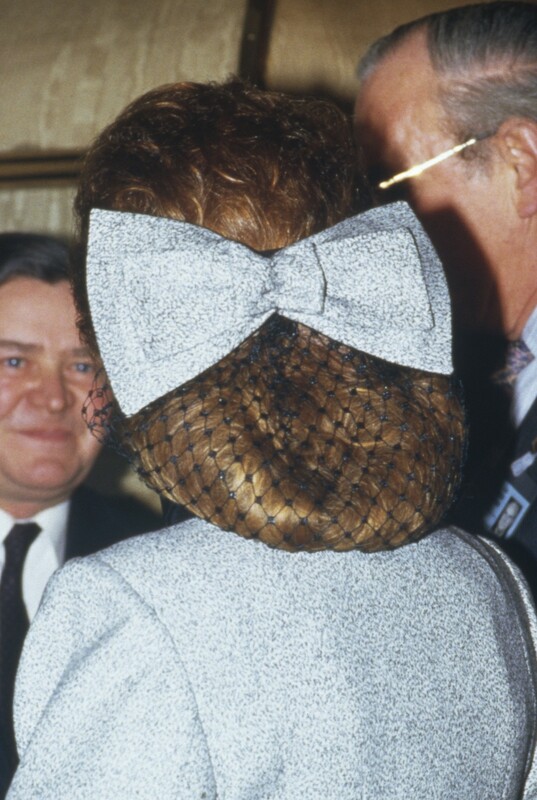 So, like every other girl in my year, I went to town with scrunchies and Fergie inspired (the Duchess, not the Black Eyed Pea... oh that clarification is showing my age) clip on hairbows. But there was so much more to that final year of school for me. It was do or die with regards to the Tertiary Entrance Examinations and cut off scores for university entrance. I remember vividly how my friends and I spent a great deal of time trying to predict our scores based on our term marks and what we got in the mocks. We tried to predict exam questions. Our teachers swapped our exam papers with other schools' versions. The exams were pretty much everything for that year for me. My down time was spent doing some pretty tame things. While the popular girls of our year were out With Boys in their rugby shirts, Levi 501s and Doc Martens (both them and the boys), I was home with my specs watching Press Gang and Tonight Live with Steve Vizard. They were exciting times. I know the sarcasm is palpable but I look back at that time of my life without any regret that I wasn't more rebellious or less of a dag. I guess I was being true to who I was and what I wanted to achieve at the time. I was comfortable with who I was, content in my own company and that's not a bad place to be when you're seventeen. But yes, I do wonder what became of the popular girls.... I wonder if they ever think about the rest of us with that same kind of detached curiosity. We weren't a bullying or 'Mean Girls' kind of school. We respected each others' differences while remaining in fixed orbit within our unique cliques. We also had some wonderful teachers who were able to work with each of our strengths and weaknesses and year co-ordinators who were never hesitated in their efforts to keep us on the straight and narrow. I wonder what it's like teaching the girls of today in our 24/7 world of social media, reality television, seriously skewed priorities in the mainstream media and the cult of celebrity. Is school still a kind of haven for 17-year-olds where they can be themselves and also work towards their futures? I hope it is. My final year of school was memorable also for the serious level of magazine reading I did on 'breaks' from studying. From the glossies to the women's interest ones, I read them all. Fast forward to 2017 and the only chance I get to read them is on the plane or at the hairdresser's. Determined not to be a complete couch potato in Year 12, I started going for brisk walks interspersed with a few seconds of jogging. I went from twice a week to daily and before I knew it, I was able to run continuously for 15 minutes. The daily exercise thing is something I've been able to keep up ever since. Not bad for someone who was terrible at PE. Again, our teachers at school may have had a hand here. We would go for walks occasionally for PE and many of our non sports teachers would drop a few casual comments here and there about their own approach to fitness. But most of all, what I remember best about that final year of school was spending it in one of the most beautiful cities in the world. Perth was and always will be 'home'. Some might call it dull and awfully quiet but Perth is family to me. It's also a place where the life I had was straightforward, predictable and safe. I knew my place in it and that security has given me the courage, strength, and confidence to carve out this crazy new life for myself in Sydney - Perth's glamorous but somewhat edgy cousin. I love your last paragraph. We are created in a place as well as a time. I had quite a scrunchie collection! haha! I have no idea what happened to them. I love how confidence building your school was - I often felt I didn't really fit in at school and was (well still am really!) painfully shy which made making new friends difficult. I found my own little group of friends and as the years have gone on it's been so interesting to see how friendships have played out. Despite the now distance between us and different life stages, I'm so incredibly lucky to still have a true friend who's known me since I was in playgroup with her! I wish for that kind of friendship for the boys, coupled with an inclusive and supportive school like you had growing up. Oh I wish that I had the confidence in myself and was happy with who I was at that age like you were. Even though I was sociable and played sport at school I wasn't part of the in crowd with the glamorous popular girls. Coming back to the area close by where I went to school after many years away, its been interesting to see how some of the it girls turned out.I know it's shows my age but Fergie will always be the lively red haired princess, who was responsible for so many hair accessory trends. I wish I was as comfortable with myself as you were at 17. I was a real insecure bundle then. I am meant to have dinner tonight with two of the most popular girls in my class tonight. I wonder too like you what their lives have turned out to be like and whether they are every bit as self-confident today as they were back then. One of them reminded me that her most vivid memory of me from high school was the day I labelled her as 'capricious'. And perhaps that was what made her so interesting back then in school. Thanks for the trip back memory lane.